By Dan Ambrose: In looking at photos of the face to face meeting between WBC middleweight champion Julio Cesar Chavez Jr (43-0-1, 30 KO’s) and challenger Ronald Hearns (26-2, 20 KO’s) to publicize their fight next month on September 17th at the Palengue, Cuiliacan, Sinaloa, Mexico, Chavez Jr. is looking absolutely huge. In standing next to the slender 6’3″ Hearns, Chavez Jr. looks to be weighing at least 190. How Chavez Jr can still be fighting at middleweight as big as he’s gotten really baffles me. 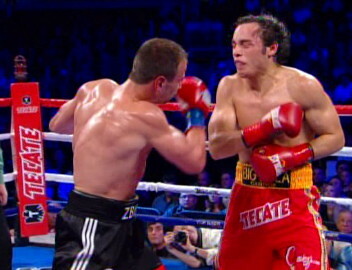 In his last fight against WBC middleweight champion Sebastian Zbik last June, Chavez Jr. came into the fight weighing a reported 180 lbs on the night of the fight. He looked like a light heavyweight fighting a middleweight on that night. And my guess is Chavez Jr. will again be weighing in the 180 pound range on the night of the fight against Hearns. Chavez Jr. looks so big right now like he’s swollen up. I honestly don’t know how he can take off that much weight in dehydrating to make 160. It’s got be very difficult and hard on his body. If Chavez Jr doesn’t do this just right, he could come into the fight at 180, but feeling weak and lethargic. As limited as Chavez Jr is on defense, that’s all it may take for the 32-year-old Hearns to score a knockout. Hearns can punch with his right hand and if you put a fighter with limited defensive skills in front of him like Chavez, he’s going to do well against them if he’s not met with a lot of resistance.